During the 5 week remodeling project at our son’s house, we did manage to fit in some play and other projects. So it wasn’t all work. After all, the paint needed to dry, we had to wait for carpet to arrive, and a little break here and there was warranted. 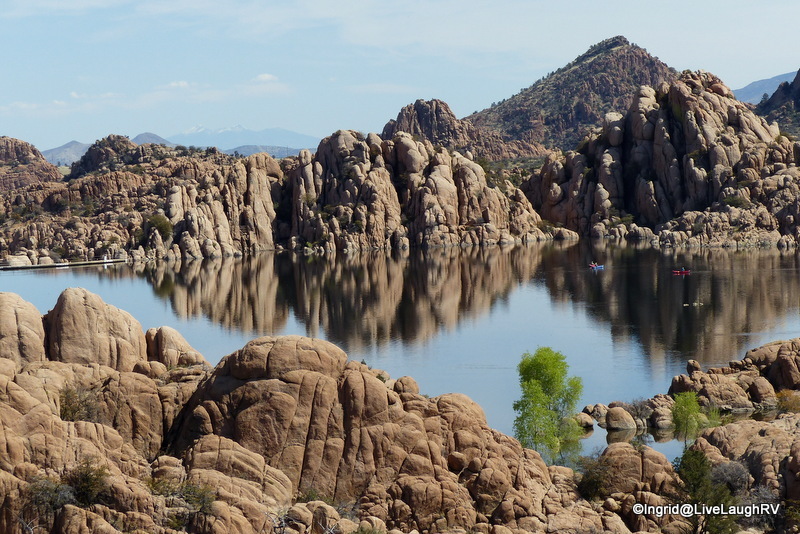 Aside from remodeling, socializing and hiking, we managed to get in a day trip up to Prescott, Arizona. Prescott continues to remain on our radar as a possible place to settle down one day. I was first introduced to this high desert community 25 years ago and again repeatedly over the past 3 years. Our day trip was two-fold. First and foremost was having the Ford F-250 serviced. Why would we go to Prescott for servicing when we were staying in a major city? Four years ago the turbo went out on the truck and we broke down on Interstate 17 near the Sedona exit. We had just dropped off a load of furniture to our son in Phoenix with our utility trailer and were returning to Colorado with the empty trailer when the truck refused to climb another hill. We were towed to the Ford dealership in Cottonwood/Camp Verde where Ted (our now preferred Diesel mechanic) gave us the low down on the good, the bad, and the ugly. We were offered the easy less expensive fix or the lengthy more costly fix. Turns out, years ago Ted worked for Ford and was a consultant on the original design team for this particular engine. He knew its strengths and weaknesses. If we went with the quick fix, it was just a matter of time and we’d break down again with another issue. If we went with the total redo fix, then our engine would easily go another 150,000 plus miles without major issue. Where’s Waldo … oops, I mean Al? Hint; he’s wearing a blue shirt. So this past winter as we crossed the seemingly never ending state of Texas, we sensed the Big Dog wasn’t running quite right. Ah, what to do, what to do? We already had a bad experience with the Peoria Ford Dealership (Phoenix area) and weren’t sure where to go for honest service. Much to hubby’s surprise, I recommended he call Ted. Ted was now working at H & H Diesel in Dewey, Arizona (a small town just before you get to Prescott). Ted had Al call him back first thing the next morning so they could talk on the phone as Al started the truck. Ted walked him through the settings on the “tuner” (which had been installed during the major turbo fix) and in less than 2 minutes it was determined the number two injector was bad. A repair estimate was given and an appointment set up. A few days later we drove up to Dewey, which was an easy one hour drive from Phoenix, with both trucks. We dropped off the F-250 at H & H Diesel and ventured off in my little Tacoma. Our first stop was Watson Lake. A few years ago, friends introduced us to this unique and stunning lake. No such thing as ‘too many’ photos! Can you see the two kayaks? Helps give scale to the enormous size of the boulders. I was loving it…. climbing here, climbing there, all the while giving that camera shutter a good working out We continued to do a little hiking and exploring with the promise to return another day to take the time to really savor and experience all of Watson Lakes’ nooks and crannies. Perhaps renting a kayak would even be in order. A short day trip to Prescott was definitely not enough time to take in everything this lovely community has to offer. When we picked up the truck, the owner, John Hughes, of H & H Diesel spent an hour educating us on the tuner and the repair. The bill was even less than the verbal estimate. It’s been 7 weeks since the work was performed and the Big Dog is running better than ever. Yes, we are very pleased with the work and this will be our go to service shop in the future. As we were leaving and thanking John, two RV’s pulled in confirming they not only work on trucks but diesel pushers as well. So let’s see…. the big truck is feeling better, the little truck was given some attention, and then I too had a check up. Now all three of us are running in tip-top shape. And if I didn’t already have enough on my plate, I decided to start another blog. I’m not sure what I was thinking especially since we were having a ton of internet/router issues at the time – and still do. One minute I’ll be commenting away on someone’s lovely blog and the next I’ll lose the connection along with whatever words I had typed. Grrr… talk about frustrating. So why another blog? Many of you know, 2014 was not kind to me in the health arena. My new blog will focus on cooking and how diet plays an important role in how we feel. I still don’t have a solid focus regarding this new blog, but I know it’ll evolve over time. Food allergies and sensitivities are a huge issue. The food we eat today is not the food our ancestors ate. Preservatives and genetically modified grains have changed the game. Before I did the post on “Blogging lessons learned“, I did a little research. One common thread was repeatedly mentioned; have a focused topic and know your audience. That said, I think some of you that follow this blog might be interested in my recipes, a Paleo diet, health, etc., but I feel the majority of Live Laugh RV followers are more interested in our travels and photos. However, if I am wrong and you are interested in food and health, click on over to Dally in the Galley and follow me over there. I also have my food blog link in my side bar with the above wine photo as the feature. Also, since I’m usually posting here a couple of weeks (or more) behind in our destinations, if you’re every wondering where we’re at “today”, I update our current location in the side bar with the photo of Al and me. We left Phoenix on May 7th leaving behind beautiful clear skies and warm temperatures. Now we’re wondering why we left. The weather in Colorado has been wetter and colder than normal. Yikes, snow in May? All part of the adventure I guess! Ingrid – what amazing photos you have of Watson Lake. It looks like the perfect place for some exploring. I would love to do some kayaking on the lake. 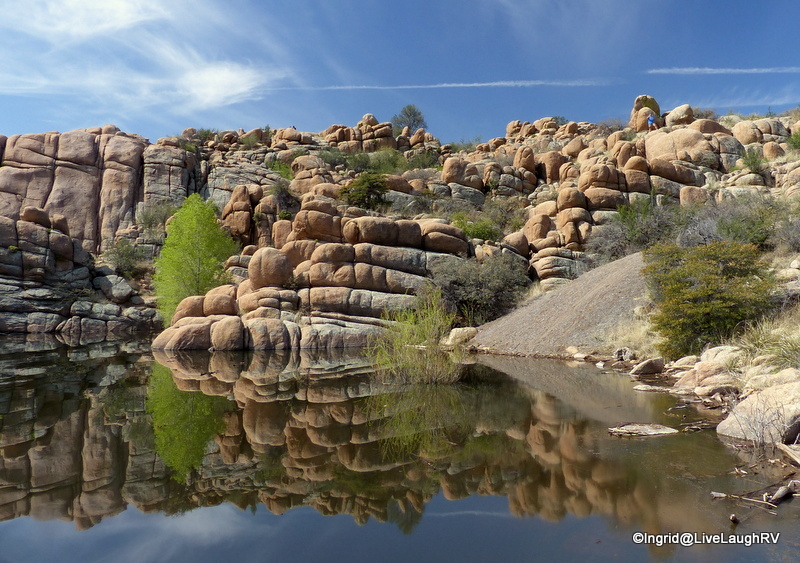 The boulders and the reflections make it very picturesque. Having people in the pictures (though they weren’t easy to spot!) definitely helped grasp the size of the boulders. Thank you. I’m hoping to return to Watson Lake in the fall or spring and rent a kayak. We’ll see how long I can keep up with a second blog. I don’t think I thought it through well LOL. These pix of the lake and rocks are STUNNING. I definitely HAVE to see this place! It’s such a beautiful sight that photos just can’t capture the uniqueness of the area. If you ever fly into Phoenix and drive up to the Grand Canyon, a stop here would be perfect since it’s on the way. We actually have a western jaunt planned for next year. I’m going to see what I can do about adding this little gem into the mix! Let me know if I can be of any help in regards to your trip. This is a part of the world I know very little about and have never visited. After your great photos I guess I need to correct that! Oh… Watson Lake was like a sheet of glass. Beautiful reflections in all of your photos! Lovely photos! Thanks Nancy. We really lucked out with no winds. I’m looking forward to spending more time there next season. As many times as we have been to Prescott… We have never been to Watson Lake! That will be a must for us the next time we go up. We do a lot of antiquing in Prescott. For some reason your new posts are not showing up in my email… so I did some finagling… and I think all is okay now! Still hoping the weather gets better for you! Something funky has gone on in the blogosphere. I’m missing posts from quite a few blogs that I follow. I’ve been going through my reader too and can’t figure out why so many aren’t showing up…. grrr! What a great post! 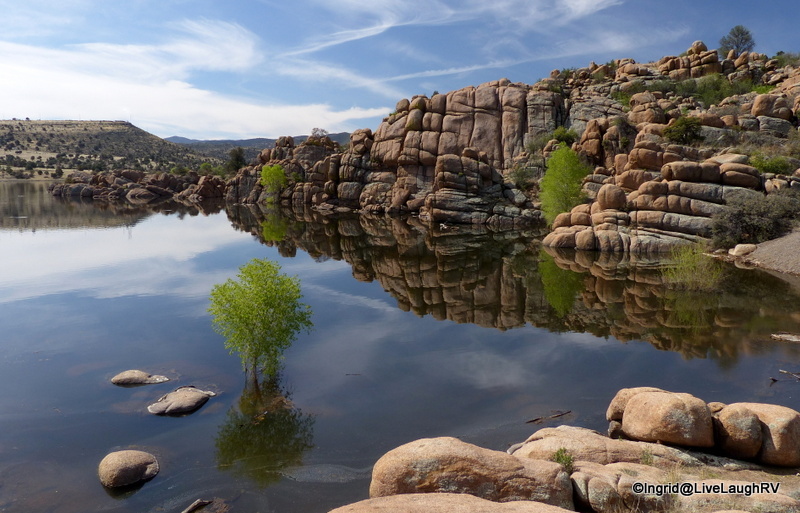 Stunning photos of Lake Watson that call all RVers to experience it for themselves. And, you shared your diesel mechanic with all of us. I will keep him in mind when our F250 has problems. Thanks so much for the beautiful photos and your mechanic!! i hope you are feeling better soon, Ingrid. Just recently boondocked in Cottonwood and enjoyed this area – could not spend much time, as we are pushing north to Alaska for summer. 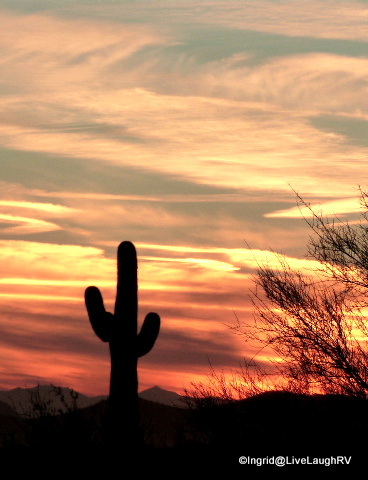 We will come back for sure and include Prescott and Sedona in our travels. Awesome blog! Terrific photos, Ingrid, in a truly awesome setting. 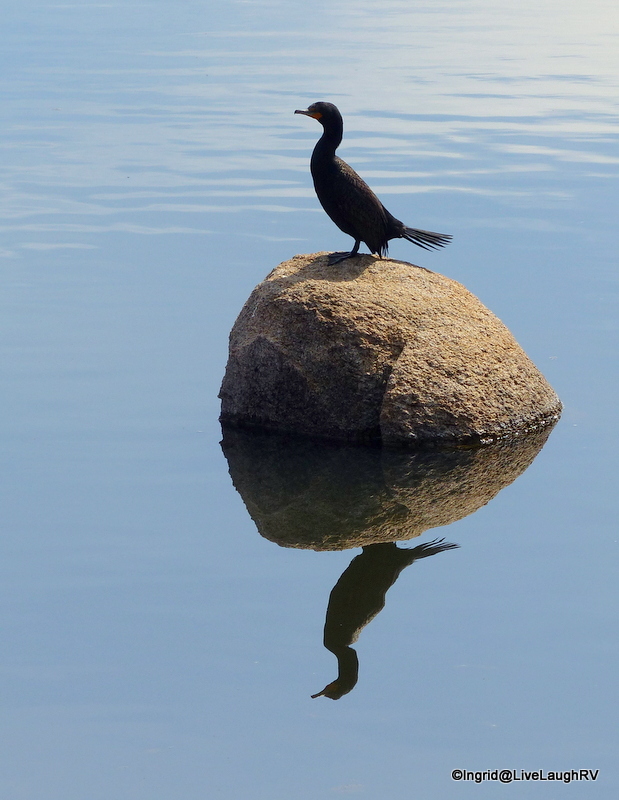 Love the cormorant shot. I’m glad you finished the house project and made time to get other things in order, that’s always a good thing. The photo look great and I am glad the Reno wasn’t all work. Will check out the food blog for sure. Thank you – I really lucked out with super calm winds to get some nice reflections in the water. The first picture, of Watson Lake, is just gorgeous ! It looks so calm and peaceful. And the colours are fabulous !! what an interesting place (and unknown to me). About the food blog, I’m also very interesting in the paleo diet ! I’ll will happily follow you over there ! 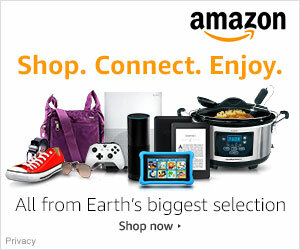 I can’t wait to discover new recipes ! A good, honest mechanic is so hard to find. Sounds like you have a keeper! I see kayaking in that lake in your future! Will also be checking out your food blog. Although I love barbeque and Cajun food I do try to eat healthy most of the time! Yes, I think a paddle on Watson Lake is most likely in my future 🙂 And isn’t BBQ and Cajun food healthy? Ingrid I am so impressed at you starting another blog. Wow! Food blogs seem very popular and it sounds like you have lots of good information to offer. 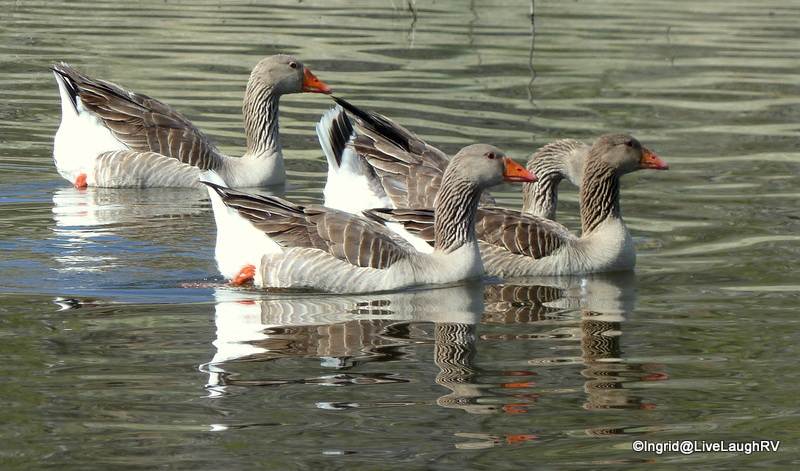 Your reflection photos are superb. Really remarkable! Watson Lake is spectacular! That’s definitely going on our list — it would be very different from any place we’ve ever kayaked. We’re paleo/primal, too, and have been for several years. Works great for us. How fun that you’re starting another website! Ha, I can barely keep up with the one we have now…. I’m not sure what I was thinking starting a second blog since I too can barely keep up with one. I guess I wanted another platform to keep track of my recipes and ideas. The jury is still out on how well that will go though LOL. We made the mistake of passing through Prescott. As we drove through was only could say “so cool town, why didn’t we stay? Perhaps next time and yes, Sedona is awesome too. Thanks and I totally agree that refined sugar is really bad as is white flour. We shop the outer isles predominantly staying away from processed foods. Your photographs are lovely! I think I need to add this destination to my “to do” list. Thank you! I’ve never been to the Prescott area – will need to look closer at this little mecca. I think you two would really enjoy the Prescott area. 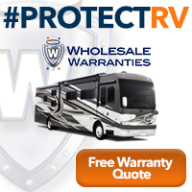 There seems to be a couple of nice RV parks as well. I love Prescott, and Watson lake is a very interesting place to wander. The food blog sounds good. I was eating Paleo several years ago before we started full timing. But it just got to be too much to try and carry all the special food. I did feel better though. Thank you Amy. I didn’t think about it, but you could’ve stopped at Watson Lake on the way to the Grand Canyon since there’s more than one route to take. Wish I knew this place, it’s so different and beautiful. So much to see in AZ. As soon as I saw your first photo I knew I had to be looking at Watson Lake! We too loved Prescott and will consider living there when the time comes to make that decision. I love to cook and we eat super healthy. So even though we do not follow a Paleo diet, we eat Paleo food often…I’ll be checking out your posts there as well as here. 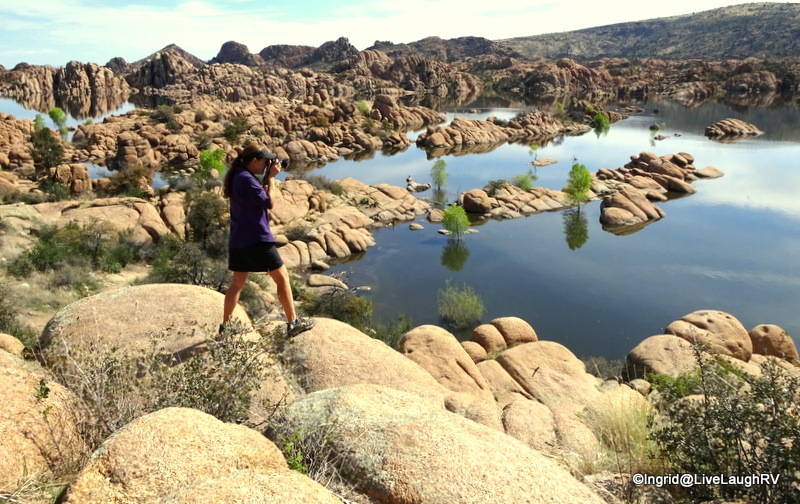 We can’t wait to return to Prescott next year so we can explore some of those trails you as well as Pam hiked. It’s such a pretty area. Finding someone your trust to work on your truck or rigs is priceless. You are right, breaking down on the road is extremely stressful as you are not only dealing with the problem at hand, you have the stress of not knowing if you are being taken advantage of. I would drive an extra few hours to go to someone that I trusted. Ted sounds like a stand up guy! Sorry, can’t do Paleo, but I am trying to eat healthier (i.e. no more canned veggies – I’ve progressed to frozen and plan on going to fresh). What a b-e-a-utiful area! Yes, the Prescott area is extremely beautiful. Fresh veggies is the only way to go. I don’t think I’ve purchased a can of vegetables in well over 20 years. If I want to stay active, I have to watch what I eat and rarely am I tempted to revert to old habits. I’m sorry your truck needed a tune up but glad you were able to visit Watson Lake because those photos are gorgeous. I’ve been to Arizona a half a dozen times and it has never called out to me but Watson Lake, now that is something on a whole new level. 🙂 What would our grandparents think if they read a list of ingredients on any of the food items in any of the aisles of our grocery stores? Toxic, is what they’d think. Arizona can be so diverse and has tons of hidden gems. We’ve enjoyed discovering some of these unique places. Toxic is exactly what some of the ingredients are and some of us can’t process those ingredients. My food journey has been eye opening! That is a beautiful area, and it is actually close to an area that I am keeping in mind for another place where we can meet our California kids that is roughly half-way, more or less, with a big airport to fly in and out of not far away. Denver area is the other area we are looking at. Hope you are not freezing in Colorado. It has been 30 degrees below average May temps here this week. I’ll take it while it lasts! 😉 Will definitely check out your other blog. y diet is probably similar to yours in many ways but must stick to low-carb. Definitely have issues with carbs these days. Paleo is close, though. Wow, great photos! Now I want to visit that lake 🙂 An honest mechanic is something to treasure….. Thank you for sharing with us. Ahhh, another place to explore, a diesel service place to remember, and a new blog to read! “Aint” life just grand. Yep, sure is. I absolutely LOVE the Watson Lake area. Though we have been through Prescott, we never did much exploring…Kudos on the new “health” blog…I will slide over there and see if you can help me get my act together..no doc seems to give me any answers. I think Ted is the same guy we dealt with several years ago when we had to have a fuel injector replaced in Cottonwood. Terry was very impressed with him. 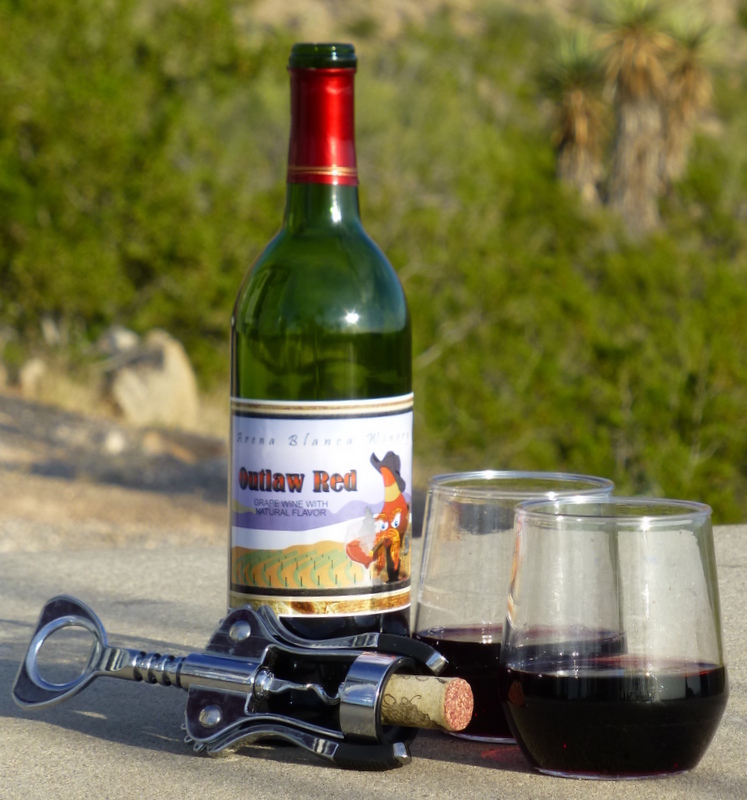 We are going to have to make a trip to Prescott the next time we are in the Sedona area. Terry’s sister used to live there and your beautiful photos are calling me back. We’ve always enjoyed Prescott and may spend a little more time there next year. I know the trails and lakes are calling to me as well. Ted is well known in the area and has a good reputation from what we were able to gather. Interesting that we both have had experience with Ted. 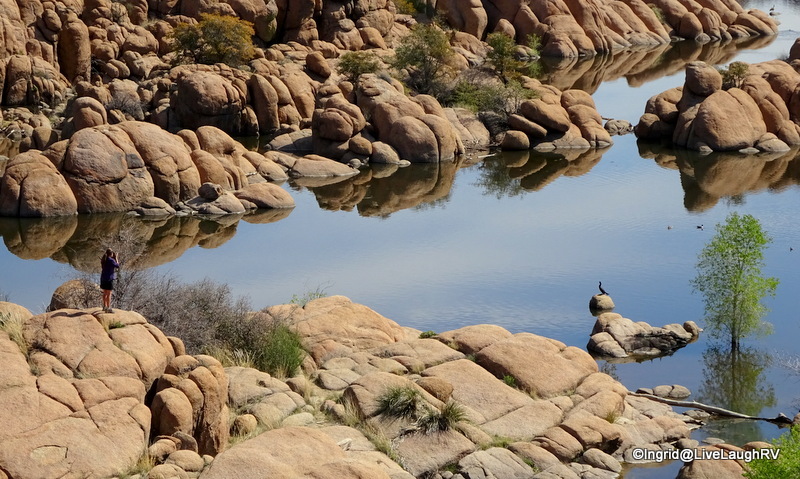 Your photos of Watson Lake with the reflections are beautiful. It is such a fun place to hike around:) We did kayak on the lake and had a grea time paddling in to all the little coves. As I mentioned to you, this is a place on our future list, as well:) Always good to find a trustworthy mechanic! Thanks Pam. I remember your kayak post on Watson Lake. I would love to get out on the water there. I know we’ll return to the area and take in some of those hikes you did. Thank you Anne. I lucked out with a beautifully calm day so the lake had fabulous reflections. 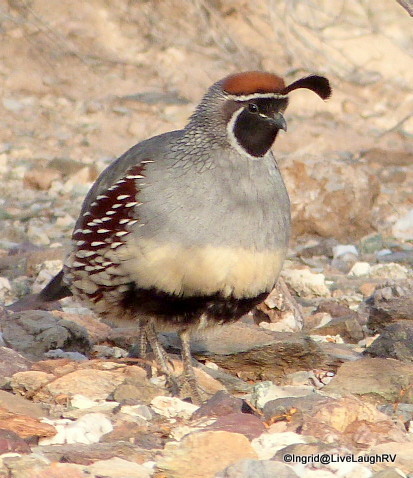 I think next year we’ll need to hang around Prescott a little longer. Thanks and boy, you said that right “not for sissies”. It seems if it’s not one thing it’s another. Hope the Lazy Daze is running great and you can enjoy your summer.